(Nanowerk News) Engineering researchers the University of Southern California have made a significant breakthrough in the use of nanotechnologies for the construction of a synthetic brain. They have built a carbon nanotube synapse circuit whose behavior in tests reproduces the function of a neuron, the building block of the brain. The team, which was led by Professor Alice Parker and Professor Chongwu Zhou in the USC Viterbi School of Engineering Ming Hsieh Department of Electrical Engineering, used an interdisciplinary approach combining circuit design with nanotechnology to address the complex problem of capturing brain function. 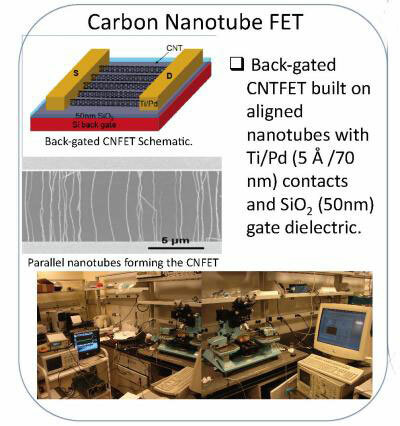 In a paper published in the proceedings of the IEEE/NIH 2011 Life Science Systems and Applications Workshop in April 2011, the Viterbi team detailed how they were able to use carbon nanotubes to create a synapse. Carbon nanotubes are molecular carbon structures that are extremely small, with a diameter a million times smaller than a pencil point. These nanotubes can be used in electronic circuits, acting as metallic conductors or semiconductors. "This is a necessary first step in the process," said Parker, who began the looking at the possibility of developing a synthetic brain in 2006. "We wanted to answer the question: Can you build a circuit that would act like a neuron? The next step is even more complex. How can we build structures out of these circuits that mimic the function of the brain, which has 100 billion neurons and 10,000 synapses per neuron?" Parker emphasized that the actual development of a synthetic brain, or even a functional brain area is decades away, and she said the next hurdle for the research centers on reproducing brain plasticity in the circuits. The human brain continually produces new neurons, makes new connections and adapts throughout life, and creating this process through analog circuits will be a monumental task, according to Parker. She believes the ongoing research of understanding the process of human intelligence could have long-term implications for everything from developing prosthetic nanotechnology that would heal traumatic brain injuries to developing intelligent, safe cars that would protect drivers in bold new ways. For Jonathan Joshi, a USC Viterbi Ph.D. student who is a co-author of the paper, the interdisciplinary approach to the problem was key to the initial progress. Joshi said that working with Zhou and his group of nanotechnology researchers provided the ideal dynamic of circuit technology and nanotechnology. "The interdisciplinary approach is the only approach that will lead to a solution. We need more than one type of engineer working on this solution," said Joshi. "We should constantly be in search of new technologies to solve this problem."